“Aai, how did Kiki know where I live,” queried an incredulous J. We had just finished reading Message in a Bottle, the latest literary addition to our home library. Let me tell you more about what prompted the question. Message in a Bottle is a personalised children’s book written by Tom Percival and illustrated by the incredibly talented Tuire Siiriainen. I was part of the launch team for this book along with some fellow bloggers. We have seen the hard work that has gone into producing this inspiring tale of adventure. Kiki, the protagonist, is a tiny red bird with a big sense of adventure. She wants to spread her wings and explore the world. 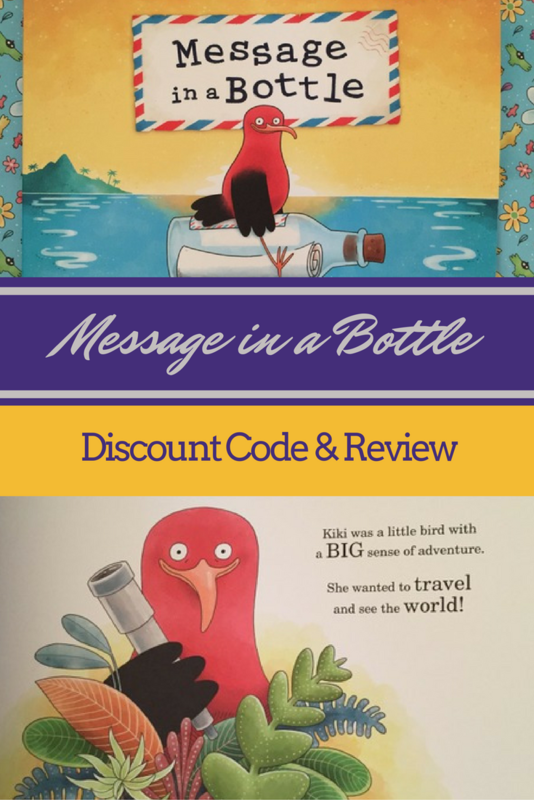 The perfect opportunity presents itself when Kiki finds a message in a bottle. This is no ordinary message. It is the message you wrote when you chose to order a copy of Message in a Bottle and personalise it! Kiki takes it upon herself to deliver the lost message. She meets a number of interesting animals along the way, each playing a part in the development of the story. After a few twists and turns in the plot, Kiki succeeds in delivering the message in the bottle. J was full of wonder at how his parents had managed to get a letter with his name on it inside a book. He also had lots of questions about how Kiki had travelled around half the world to find him. That, in my opinion, is the hallmark of a good book – when it gets the reader thinking and asking questions. I love how there is an educational angle to the story. Kiki’s flight path is geographically accurate. The animals she encounters along the way are well researched. The book itself is published on good quality, thick sheets of paper and feels substantial to hold. The beautiful, eye-catching illustrations on every page add to the overall appeal. Ordering a copy could not be easier. All you have to do is add your child’s name and address when prompted and then write a message to them. You have the option to choose from a variety of pre-written templates if you wish, and to add a photo. You can choose to have the book gift-wrapped as well. The personalised message in the bottle is what makes this book truly magical. It is an opportunity for you to say something that will stay with your child forever. Those printed words will be read over and over again and have the potential to make a positive impact. And if that wasn’t reason enough to order a copy, Tuire and the team are offering 15% off the RRP of £19.95. Just use the code OINZH1 when you place an order on the website. Disclosure: We were sent a copy of this book in exchange for a review. All opinions are my own. Thank you, Victoria. It was a pleasure to be involved with such a creative venture.